Searching for early-season stripers on the Cape requires industrial-strength protection from the elements. Our River Salt Jacket stands up to salt spray, hard use and serious nor’easters. Now made with an even tougher H2No® Performance Standard 4-layer, 6.1-oz wader fabric with a waterproof/breathable barrier and a DWR (durable water repellent) finish, this is the burliest waterproof/breathable fishing jacket on the market. The waterproof, corrosion-resistant YKK® Vislon® Aquaguard front zipper and watertight, adjustable cuffs seal out wind-driven precip. Two large, streamlined front pockets hold fly boxes; close with coated, water-repellent zips; and won’t snag flying line on the shoot. When you have to crank up and run into the teeth of it, the innovative vented hood stays in place at speed. 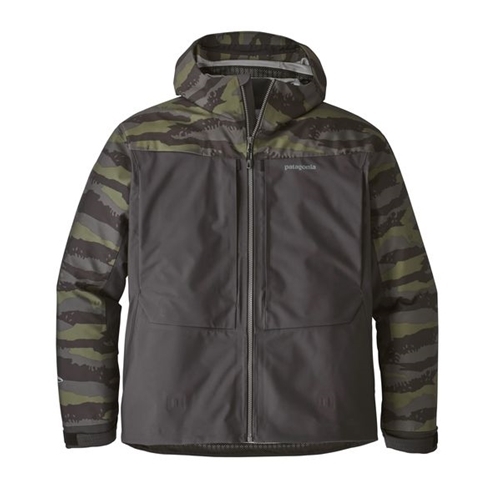 This jacket is great for windy condtions and is more waterproof than any wader out there.